Self-deprecating, Donald Trump is not. But he played along, even when the jokes were at his expense, in his first late-night TV appearance as a presidential candidate. During a visit to NBC's "Tonight Show" on Friday, Trump said "I like people that are nice to me," raising the question of why he agreed to appear with host Jimmy Fallon. Trump has been giving comedians like Fallon plenty of material to work with ever since he entered the race in June. At one point Fallon even half-apologized for his past Trump punchlines. But Friday's mostly news-free appearance gave Trump, the 2016 Republican frontrunner, an opportunity to promote his campaign while embracing the qualities that people find so entertaining about him. When Fallon suggested a new song for the campaign -- DJ Khaled's "All I Do Is Win" -- Trump grinned, waited a beat, and then said, "Honestly, it happens to be 100% true." While Trump didn't seem entirely comfortable in the late-night setting -- he sat up straight the whole time -- he told Fallon he'd come back on the show soon. And he already has another late-night interview lined up: Earlier this week, he agreed to sit down with Fallon's chief rival, CBS's Stephen Colbert, on September 22. Friday's night's most-replayed moment will probably be the highly entertaining (and scripted) sketch that set up the interview. Fallon dressed as Trump and pretended to primp in the mirror and give himself a pep talk for the interview. "Wow, I look fantastic," Fallon as Trump said. When he looked in the mirror, he saw the real-life Trump. "No, WE look fantastic," Trump answered. 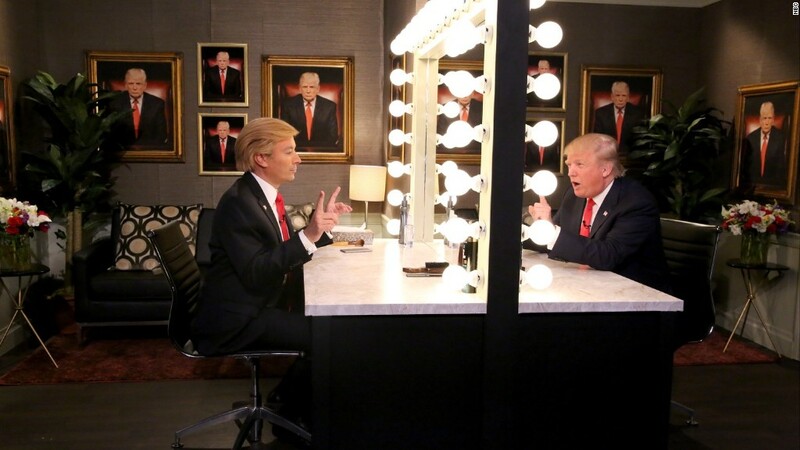 The actual Trump joked about how interviewing himself is a great idea. He proceeded to play along as Fallon poked fun at him and what critics say is the hollowness of Trump's proposals. Fallon as Trump: "How are you going to create jobs?" Trump: "I'm just gonna do it." Fallon as Trump: "Right. Right. But how?" Trump: "By doing it. It just happens. Just by doing it." When Fallon asked who the actual Trump might pick as a vice president -- Gary Busey? -- Trump brought up Kanye West as a pretend possibility. During the interview, Fallon talked about the ways Trump has thoroughly disrupted the Republican presidential race. He admitted he didn't believe Trump would actually run for president, and then, with an air of disbelief, said, "I still don't! Are you?" Trump repeated many of the lines that his regular viewers have heard before -- about his poll performance, his successful rallies and his belief in the need for a wall along the southern border of the United States. As Trump concluded one particularly long answer by invoking the size of his crowds at stadium rallies, Fallon exclaimed: "What question did I ask? ... Did I ask about stadiums? I don't know what the hell just happened." Otherwise it was a mostly playful back-and-forth. CNN contributor Bill Carter, the author of two definitive books on late-night, called it a "love-fest exchange." Perhaps the most telling line from Trump came when he generalized about his 15 Republican rivals. "To me they're all the same," he said. Trump also reprised his proposal that CNN, the broadcaster of the next GOP debate, donate profits from the telecast to veteran's groups. When talking about the high ratings for his TV appearances, he remarked, "I should be paid for that, right?" Around 5 p.m., more than 100 tourists, Trump fans and camera crews were lined up outside the building's 49th Street entrance, hoping to catch a glimpse of the candidate after the interview. And Trump soaked it up, tweeting a picture of the crowd as he exited. The Fallon interview came on the same day that Trump settled a business dispute with the NBC network's parent company NBCUniversal. NBC announced its plans to break off corporate ties to Trump in July. But NBC and Trump remained 50-50 owners of the Miss Universe Organization until Friday, when Trump signed the papers to acquire NBC's stake.